Induction hardening is a method similar to flame hardening, with the exception that the heat is generated in the metal by an induced electrical alternating current. The only metals that can be induced hardened are those that are conductors or semiconductors. 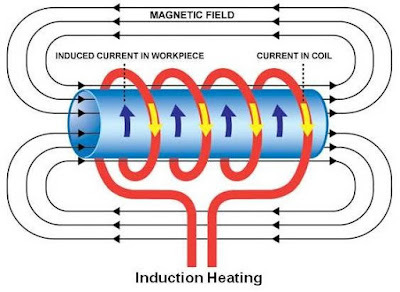 The ACHF (alternating current high frequency) obtained from a pulsating magnetic field about a wire produces the heat in induction hardening. The heat results from molecular agitation induced by the electricity. The high-frequency, low-voltage, high ampere current produce a great number of eddy currents which are primarily responsible for the heating of the metal, although hysteresis is another source of heating. An inductor block, similar to a primary coil in a transformer, is placed around the part to be hardened. This coil does not touch the metal. A high frequency current is passed through the block or the coil and induces a sympathetic current in the surface of the metal, creating heat, a process called hysteresis. As the temperature of the metal reached the transformation range, the power is turned off, the heat source is removed, and the area is quenched, usually by a spray from a water jet built in to the inductor block. 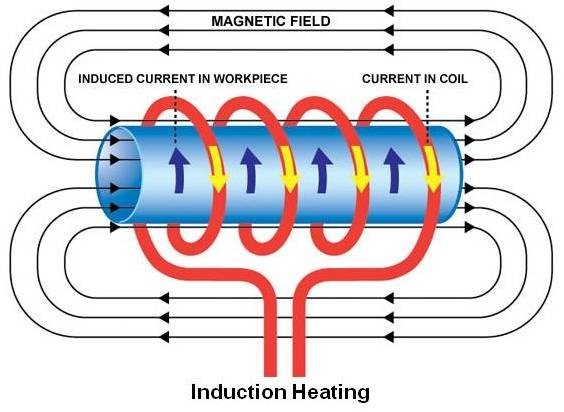 The most important aspects of induction heating is its rapid action. For example, it requires only a few seconds to heat steel to a depth of 1/8 inches. The heat produced by induction is the result of both current and frequency. Higher currents produce stronger magnetic fields, while higher frequencies produce more pulsation of the field within a given time. A specific degree of heating can be obtained either by using high current at low frequencies or low current at high frequencies. However, high-frequency induction heating of metals requires a device that can convert 60 hertz (Hz) power to a high frequency of several hundreds or more cycles per second. the frequency most used for metal treating applications is 450 kilohertz per second(KHz/S). Increases the labour productivity by reducing the time requirement for this heat treatment operation. Deformation due to heat treatment is considerably reduced. By controlling the current the hardening of the surface can be easily controlled. By changing frequency of supplying voltage the depth of hardness can be controlled easily.